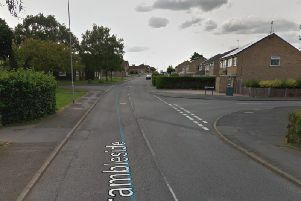 A 17-year-old robbed two young boys after he threatened to stab them with a knife in a Northampton street. The boys were walking along Broadway East in the direction of Lindsey Avenue, when they were confronted by the offender, police believe is a 17-year-old, who lifted his top to show a knife that was tucked in his waistband. The 17-year-old threatened to stab them with a knife and told them to empty their pockets. The victims did not have any on them, and the offender left without anything. Before leaving, the robber pushed one of the boys, causing him to stumble backwards. They suffered no further injuries. He walked off towards Fieldway. He is described as white, around 5ft 9ins tall and of medium build. He had short blond hair and a black eye. He was wearing a black woolly jumper with a zip up the front. The top was unzipped with a white t-shirt underneath that had the word ‘VAN’ in a red box with white writing. He had on blue jeans and blue/white Nike Airforce trainers. The knife had a black handle which was covered with a green rope around it. Police today (Tuesday) released details of the robbery, which happened at around 3.30pm on Tuesday, July 26.